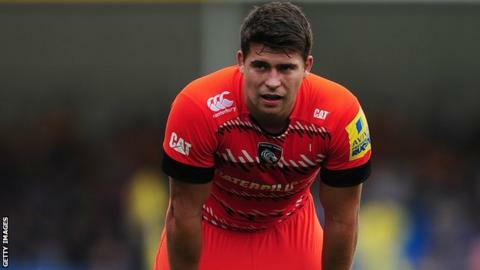 Ben Youngs says Leicester risk being heavily beaten by Toulon in Sunday's European Cup tie if they do not make a big improvement on recent displays. Tigers were unconvincing winners over Wasps last Saturday and lacked fluency in the 26-5 victory over London Welsh. England scrum-half Youngs, 25, told BBC Radio Leicester: "Performances have not been what we expect as a side, but also not what we expect as individuals. "We cannot play like the past couple of weeks and expect to get anything." "This is an opportunity to test ourselves against Test players, against world-class players. We have to thrive on that and bring that edge and excitement to the side. That's the avenue we will go down to get that buzz." Tigers have won one and lost one of their opening two games in Pool 3 and Sunday's home match against Toulon is followed by a trip to France to face the same opposition again. A victory at Welford Road would give Leicester a chance of still finishing top of the pool - but defeat would leave them needing to win each of their remaining three games to give them a realistic chance of progress. "In the European Cup against Toulon guys will turn up and bring that little bit of edge," said Youngs. "Hopefully we can get back on track. "You can't afford to make any errors. Guys like Brian Habana - the quickest guy in rugby - will punish you. "We have to be right up there in terms of our physicality and application, and all those things."